Shepherd in the high Mountains. Oil on canvas, 45 x 41 cm (17.7 by 16.1 in). Signed. Original frame. 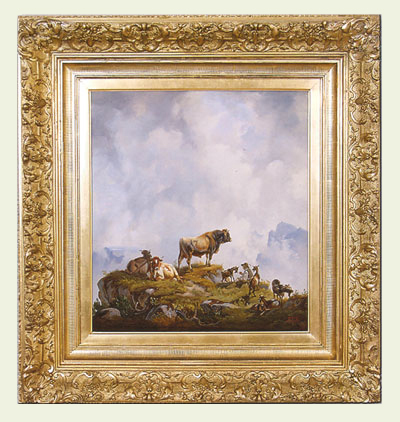 The artist was a master of idyllic genre and animal pieces. His paintings are characterized by a atmospheric composition. He was a pupil of his father, Johann Michael Voltz, then he visted 1834 the Academy in Munich. His early works are influenced by the horse painter Albrecht Adam and his colouristic and realistic style is close to his friends Carl Spitzweg, Eduard Schleich the elder, Bernhard Strange, Karl von Piloty and Carl Rahe. In the years 1843 to 1846 follows study trips to Italy, France and Holland, with noticeable influence by the Dutch landscape painter BC Koekkoek. Voltz was a member of the academies in Munich, Berlin and Vienna. He received a Professor title and serveral awards including gold medals. His works can be found in German museums and galleries including Neue Pinakothek in Munich. Literature: Münchner Maler im 19. Jahrhundert (Artists in Munich at the 19th Century), Vol 4, p. 300, Fig 446-449. Fine atmospherical painting of the 19th Century by the well known Munich artist. Excellent original condition. Further details and price on request.